Good Morning Message For Husband : Wake your husband up romantically in the morning so that he could start his day with lots of enthusiasm and spirit. Stay away from the boredom of married life and do something special that will add more happiness to your husband’s day. 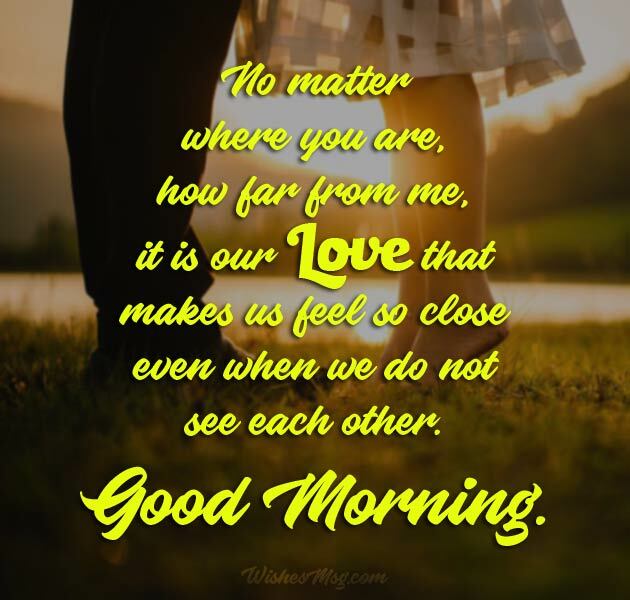 Turn this blurry morning a charming one and greet him a very sweet morning by these Good Morning Message For Husband and lovely wishes which will convey your love, care and affection to make his day awesome. Also, you may put a romantic poem or good morning quote on their pillow and spray one of his favorite perfume around the bed so he can wake up with a cute smell which will be a fantastic moment of his life. Give your husband a treat of romance, fun, charm and deep emotion. Let’s make every day a memory that will support the foundation of your wedding more stronger and full of true affection. Dear Husband, I want to live every day of my life with you, both at the starting and the ending. Cannot live without you. Good Morning. I wish that every morning of mine starts with a lovely smile on your face and end with the caring hugs from you. Good Morning. My Husband, my world centers around you and is nothing without your presence. You’re my power and strength. Good Morning. Your morning kisses and hugs speak more than a thousand words and express a lot of love for me. They melt my heart. Good Morning Dear. Every individual is created for someone else and I am happy that you are here for me. Good Morning, My Love. I promise you to be there by your side forever and to be your lover, friend and wife. Good Morning. Life is too short, and I don’t want to miss a single moment to tell how much I love you and care for you. Good Morning, my beloved Husband. Life is great when my morning starts with you after having a wonderful dream of you at night. Good Morning Dear. Right now, you may be miles away from me but you are always there in my heart. Miss you a lot. Good Morning. A thousand miles cannot keep us apart. Our love will grow stronger with the passage of time. Good Morning. No matter where you are, how far from me, it is our love that makes us feel so close even when we do not see each other. Good Morning. Your love makes me feel awesome in the morning and keeps me alive for the next day. Good morning. Honey, how I wish you were here in front of me when I open my eyes in the morning! Hope we will be together very soon. Good Morning. The moments we spent together were the most wonderful memories of my life, the memories I want to cherish forever. Good Morning, Dear Hubby. With you, we make an amazing couple. You fulfill all my expectations and make my dreams come true. Good Morning Dear Hubby. I may not know how to show it but my love for you is real and endless. Good morning, Honey. Life is not certain, nothing in life is so sure, but one thing is sure that I love you to the end of my life. Good Morning. You light up every single day of mine with the sparkles of your love. I am so happy with you. Good Morning, Dearest Husband. Your smile at the first hours of the day makes the rest so wonderful and charming. Good Morning, My Love. Life is magical when you wake me up in the morning, hold me in your arms and kiss me in the forehead. Good Morning, Love. Very good morning to the man of my dreams. Let’s start your day knowing that it holds all my love for you. Your love makes every day so colorful and heavenly, Good Morning! Good morning to the most charming Husband in the world. Sending you good morning wishes coated with a sweet kiss and warm hug. 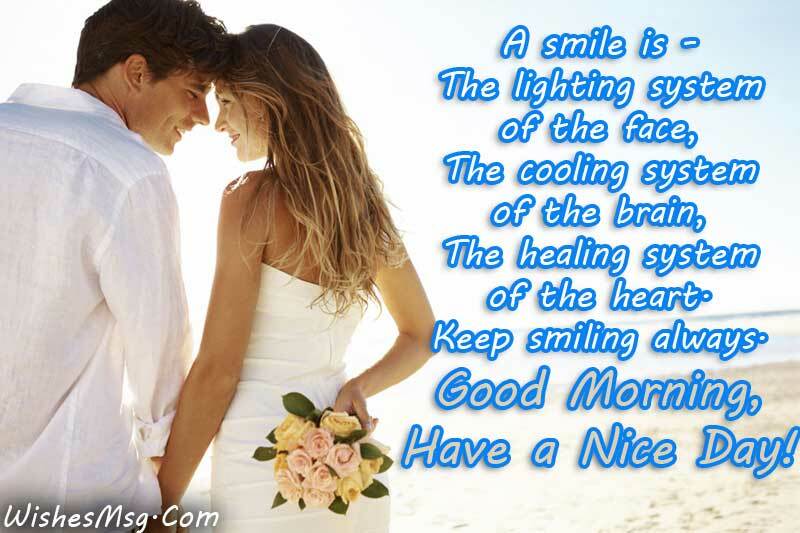 Sending a Good morning to wish to my Dear Husband with all the love from the bottom of my heart. Mornings are beautiful when your husband is a cook! Dear Husband, Good Morning. Good Morning, Dear. Don’t visit my mind all the time, or else I will surely kidnap you and keep you with me always. Waking up together is not a good morning. A good morning is you waking up first and making a cup of tea for me! ace, joy comes in my heart in every single morning when I wake up and see your face. Good Morning handsome! Good Morning, Sweetheart. Woke up yet? Or just passed the night thinking of me! Good Morning! Thanks for waking me up! I was having a dream of you. It was a nightmare! Good Morning, Honey. Hope you had a tight sleep and had enough of the blanket to cover you up last night! These good morning messages for husband convey such kinds of words that can surely melt your husband’s hearts upon receiving your wish in the morning. Don’t be late to light the fire of your romance at the early morning and feel free to share these morning wishes messages with your beloved husband via text, social media or in a good morning card.